As the sign on the right of this picture says, they BBQ every Saturday. The 4th of July was no exception. I’ve known about these guys for years, but am always surprised that a lot of people don’t. They are really close to where my Mom lives and on a breezy day, I swear that the delicious, smoky scent can be detected from her front door. Yesterday, I had a craving for the one thing they make that I always fall back on: the tri-tip sandwich. For six bucks, you too can have a fist-sized portion of juicy, tender tri-tip, on a garlic roll and slathered in their own sweet barbeque sauce. It’s fantastic and the other great thing about it is that all the profits from your indulgence go back to the community. The Elks are the third largest provider of college scholarships in the United States, behind only the federal government and the Bill and Melinda Gates foundation. Mikey and I are all for education, especially when it seems that people nowadays are only getting dumber. (Except those of you who read our site, of course. 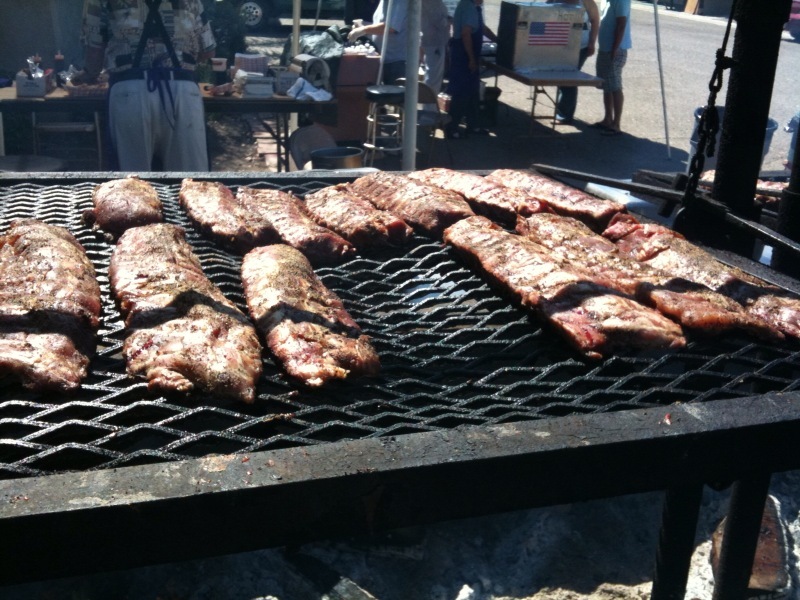 )Just because the tri-tip sandwich is my favorite, doesn’t mean that the rest of the bbq isn’t great. For the price, I think the ribs are a great value too. Plus, it makes me feel manly to order a full rack of ribs. I haven’t had their chicken, but if it’s anything like the tri-tip and ribs, it’s probably pretty good. Another reason why I like going here is because the people are so friendly. They go out of their way to make sure I get one of the “big” sandwiches when I order and it really makes you feel good that they try to give you the best value for your money. It’s also pretty impressive to see their two huge trailer-sized grills, working at full capacity. There isn’t a whole lot else to say about these guys. They do great BBQ, charge a fair price, give back to the community and understand the concept of supply and demand. They start selling at about 10am and are usually all out of food by 2pm and since they are only open for business the one day per week, you never get the chance to get sick of it. Not that you can really get sick of good BBQ anyway. 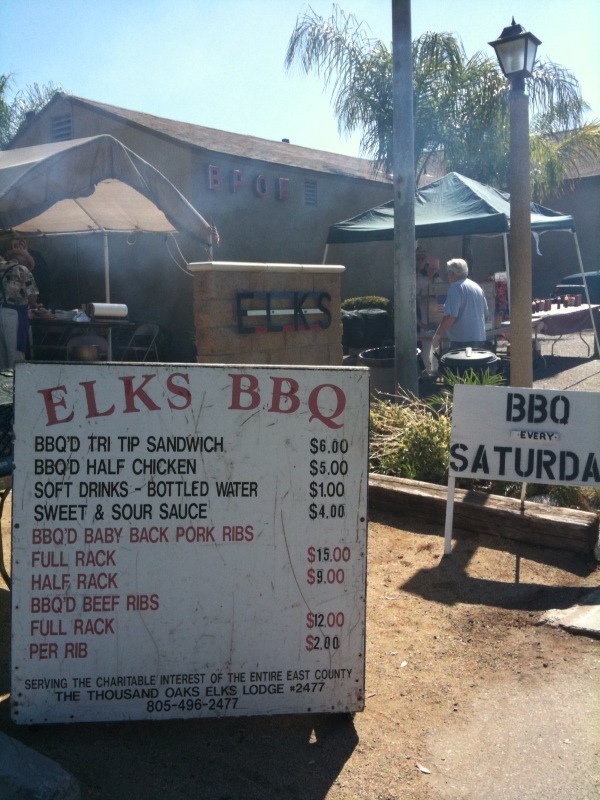 So next time you’re thinking of starting up the barbeque on a Saturday afternoon, save yourself some time and energy and give the Elks BBQ a shot. Tell ’em EatMeCalifornia sent ya! Hey, while reading on further, I wanted to throw out a place to “try” the perfect “tri” (tip). 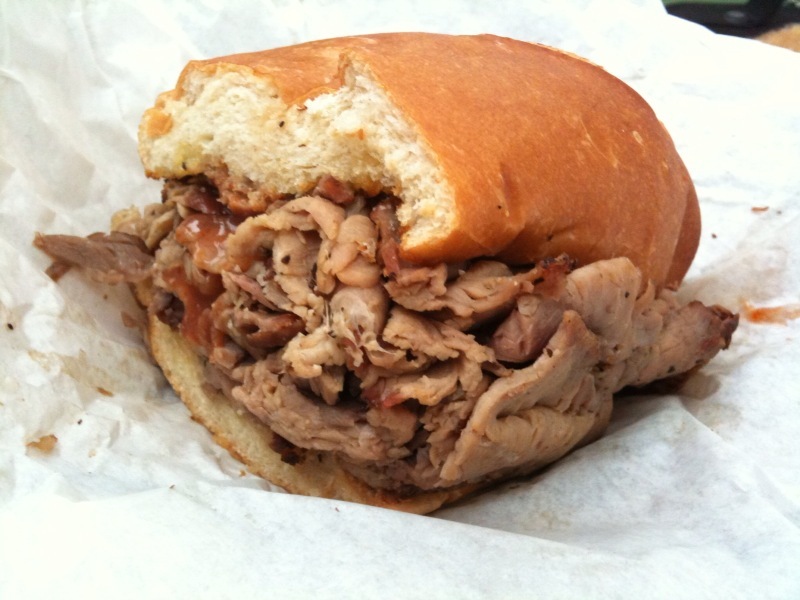 Reading that you have family in the central coastal, have you ever tried the Tri-Tip sandwich at Firestone Grill? My buddy Bartman from Arroyo Grande introduced me to this sandwich years ago. What great food and a popluar hang out place located right in the heart of downtown SLO. Tri-tip is hard to find now here since moving to the lower Hudson Valley of NY. Did I mention how much I miss home? !